Ong with a model of i-Residence, the first residential project to be built in i-City. When I-Bhd first ventured into property development about six years ago, the company decided to leverage on its digital technology prowess to undertake the construction of the first digital city in the country, i-City in Section 7, Shah Alam. That decision has proved to be a worthwhile proposition. The state-of-the-art information and communications technology (ICT) urban centre is located on a freehold plot along the Federal Highway Route II fronting the Sungai Rasau toll plaza. According to I-Bhd executive chairman Tan Sri Lim Kim Hong, the strategy has helped the group to establish itself as a unique property developer with a unique development that I-Berhad can be proud of. “i-City is today one of the leading technology cities in the country – from being the first to provide fibre to the unit to having the whole 72-acres of development as a Cisco network. “Being a MSC Cybercity with complete information communication technology (ICT) infrastructure, the development is provided with dual source power supply, multi-telco environment and super broadband accessibility of 200mbps,” Lim relates to StarBizWeek in an interview. Chief executive officer Datuk Eu Hong Chew says i-City is the first gated and guarded mixed development that has been accorded the status as an International Park in Shah Alam. The 10-year development will feature some 12 million sq ft of gross lettable area (GLA) for a total gross development value (GDV) of RM4.5bil. Of this, about 35% will comprise residences, and the balance will be offices, commercial and retail space, hotel and service apartments, a convention complex, an intelligent school and a technology hub. Since construction took off in 2007, some 500,000 sq ft or 366 offices suites as well as a 70,000 sq ft Tier 4 data centre have been completed. Eu says Al-Rajhi Bank (Malaysia) had in 2009 invested RM95mil to purchase 250,000 sq ft of the office suites for investment purposes, adding that another institutional investor is expected to buy up the balance 50% of the office suites in the next three months. He adds that i-City is promoting a cosmopolitan lifestyle living in line with the Selangor state government’s initiative last July of according i-City an international community. “With this status, the plot ratio for the development has been raised to five times from three times previously which raises its GLA to 12 million sq ft from 7.5 million sq ft. Bright lights: i-City, dubbed ‘the city of digital lights,’ is fast becoming a must-see destination. “We are taking advantage of this higher plot ratio to increase the residential component to 35% of the GLA from 5% previously. This means some 3 million sq ft will be the residential component,” Eu says. The first residential project in i-City will be i-Residence comprising a 33-storey block of 346 service residences and an adjacent double-storey block of 20 duplex suites. 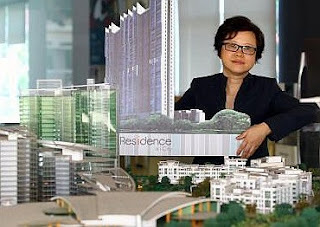 I-Bhd director Monica Ong says the service residences with built-up from 715 sq ft to 1358 sq ft are priced in the region of RM450 per sq ft, while the duplex suites of up to 3,500 sq ft will be at around RM550 per sq ft. They will be fitted with air conditioners, water heating system and kitchen appliances. “The i-Residence design is also in line with our master planner Jon Jerde’s concept of having luscious we well as pedestrian friendly environment,” adds Ong. Being part of the MSC Cybercity, the residences get to enjoy dual source power supply, a multi-telco environment and super broadband accessibility of 200mbps. According to Eu, since its inception, i-City has what it takes to become a success story. “Its location within the vibrant city of Shah Alam has opened up the opportunity for I-Berhad to get the full support of the state government, which has formed the i-City Selangor Steering Committee to facilitate its development,” he explains. Being the maiden private sector-led ICT urban centre development in the country, the project has been designated as Selangor’s International City by the state government. The state government will build a flyover from the Sungai Rasau toll plaza along Federal Highway cutting into Section 7 Shah Alam to i-City which is slated to be ready in 2013. “This interchange plans include providing an exclusive access to i-Residence as well as from both KL and Klang,” explains Ong. Under the light rail transit (LRT) blueprint, the extension of the LRT system from Kelana Jaya to Klang will also serve i-City. “i-City’s business plan involves not only developing properties for sale as well as for long term investments, but also to build up its leisure business based on i-City’s vision of being both a knowledge hub as well as a tourism destination. “We started i-City with the MSC Malaysia Cybercentre development. 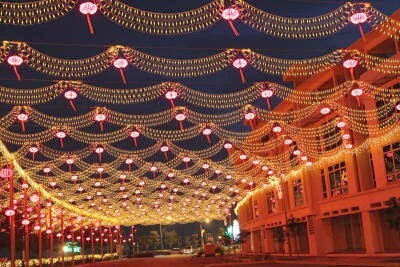 “Then in December 2009, we opened ‘The City of Digital Lights’ as it’s first leisure component. This year, we are launching our first residential component,” adds Eu. The other decision to engage renowned American architect Jon A. Jerde of the Jerde Partnership as the master planner for i-City has also given the project its “winning streak.” Jerde has brought his Midas touch of “place-making” to turn i-City into the city of digital lights and a tourism destination that has become quite a hit among Klang Valley folks. “We believe the relationship with The Jerde Partnership has resulted in the planning for the right products in line with the famous Jerde hallmark of place-making to make a positive impact here. “Over the years, Jerde has built a strong network of retailers, mall operators and investors. Its name alone has become a premium brand that sells,” Lim says. He says projects that bear the Jerde hallmark in the US include Universal Citywalk in Los Angeles, which has redefined the urban village as an intricate weave of uses and services, and the internationally acclaimed Fremont Street Experience in Las Vegas, Nevada, that is now a dynamic destination for a new form of urban theatre. Jerde is also behind the iconic 4.2 million square feet Mall of America in Minnesota, the largest mall in the US, and one of the most vibrant shopping complexes in the world with 520 shops, theme parks and a university. In Asia, Jerde’s architectural landmarks include Canal City Hakata in Fukuoka Prefecture in Kyushu, Japan, and the famous Roppongi Hills in Tokyo. In Hong Kong, his signature can been seen in the Arcade @ Cyberport, an ICT-based residential, office and retail development. “The first leisure element in i-City, dubbed the City of Digital Lights with its 1 million LED lights is Jerde-inspired from the Fremont Street Experience. We just adapted the lightscape concept to be in-line with our digital technology approach and hence the LED lights,” comments Lim. Eu says for the next phase of the company’s growth, I-Bhd will be leveraging on Lim’s business and entrepreneurial expertise to further add value to the development. The first step in this direction is the establishment of a strategic alliance between Everbright International of China and I-Bhd in December last year to co-develop 30 acres of land in i-City. He says the 30 acres represent all the undeveloped land in i-City and will ensure that the whole development can be completed by 2020. “The strategic alliance with Everbright International is made possible by Lim’s “guanxi” or special relationship that he has established with the various parties in China since venturing into China in 1984,” Eu says. Furthermore, it will also enable I-Berhad to tap into China’s demand for investment of properties in Malaysia. With Everbright International holding 70% share, the Chinese counterpart will drive the joint venture and thus free I-Berhad to pursue other development activities. “For the next phase of i-City’s development, I-Berhad will be tapping into its branding expertise to brand it’s upcoming residential projects,” Eu adds. I-Berhad has a few niche residential property projects in the Klang Valley for launch these one to two years. 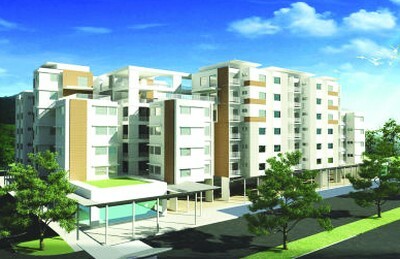 The first residential project, i-Residence in i-City, is schedule for launch in March. The 33-storey i-Residence will be the third building block in i-City after the MSC Malaysia Cybercentre and the tourism component. The second will be a luxurious condominium project in Changkat Kia Peng, Kuala Lumpur. The slightly more than an acre land in the city’s Golden Triangle is set to mark I-Berhad’s move into the high-end residential market. The parcel was acquired by Lim about 20 years ago and is today a valuable prime land located within 5 minutes walking distance to KLCC. Also on the card is i-City South, a 7-acre development to the south of the current i-City site. 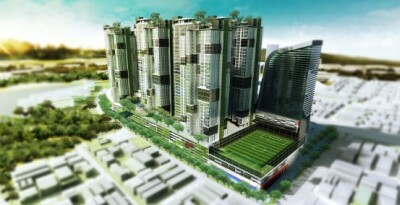 Artist impression of the PKNS Kelana Jaya Sports City project. PKNS, or the Selangor State Development Corp, is a name that used to be synonymous with social housing. Its operations way back in the 1960s tend to be rather localised. Today, the state housing corporation has made its foray into Australia. Yes, many things have changed ... Its general manager talks to StarBizWeek's Choong En Han. HAVING been in existence since 1964, the Selangor State Development Corp (PKNS) started building single-storey affordable housing that cost less than RM20,000 in Petaling Jaya decades ago. But over the decades, things have changed. Whether these changes are for the better of the company, or for the strata of people it once used to serve, is debatable. In today's housing environment, where prices have skyrocketed and where affordable, social housing is now an issue, the role that PKNS used to play and the role that it has assumed today has come into focus. It has now evolved into a mega builder and is involved in more than 60 ongoing developments in Selangor at any given time. As if that is not enough, it has 50 more projects that it is working in collaboration with private sectors and a further 30 under several of its subsidiaries. Some of these projects with subsidiaries are in Sydney, New South Wales and Perth, Western Australia. Besides residential, PKNS has also ventured into high end commercial developments. At a glance, PKNS seems to have lost touch with its roots of being a social builder, and its role to contribute to the five million people of Selangor. While it carries the name of the state, its objective seems to have changed. PKNS general manager Othman Omar explains that because PKNS does not receive grants from the Government to subsidise these projects, the state body has to create profits which can only come from its medium to high end residential and commercial developments that command a respectable profit margin. “Profit is just a means to an end, which is to maximise our profit in order to contribute more to our stakeholders, namely the state and its people. The cost of our social responsibility in terms of providing land and required infrastructure for our townships run into billions of ringgit,” he says. Billions more in subsidies are required for PKNS when it develops its low cost housing schemes, upkeep and maintenance cost, squatters relocation programmes and other heavily-subsidised state government projects. Faced with a legacy image of developing many low cost housing schemes, branding is an issue for PKNS as many believe that it would not be competent enough to build quality high-end properties. “Not long after I joined PKNS in 2009, we did a branding audit to find out how the public sees PKNS and how we stack up with other private developers and other government linked companies,” he says. Images of some of PKNS’s affordable home concept. Inadvertently, some of the branding audit findings took PKNS by surprise with 70% of what the public think about PKNS is false. According to him, many think that PKNS will most probably be slow and not efficient as it is a government-owned or government-linked company. “Over the years, as complaints appeared in the media especially regarding issues and problems with our low cost developments, the public perception on PKNS took a dive and we were labelled as a low quality builder and low cost developer,” he says. Since then, PKNS has introduced a new quality system to ensure a much higher and consistent standard of finishing its houses, with the setting up of PKNS Response team to deliver maintenance services and also a customer service department. All its rebranding efforts have also led PKNS to garner several prestigious awards including the Brand Laureate Top 10 Master Developer 2010 and the BCI Asia Top 10 Developers Award in 2011. Othman says the rebranding exercise has helped to improve PKNS's image as a reputable developer that can also deliver high-end quality lifestyle products. “Our initiatives to improve corporate governance and transparency in the organisation including the integrity pact and collaboration with Transparency International not only improve our image but deliver the bottom-line. In 2010, we saved RM115mil from our open tenders, e-sebutharga and value engineering, and we are targeting to save RM150mil from the same in 2011,” he says. In line with the changing of times, PKNS has also re-looked its business model, driving the changes it needs to sustain its operations. “What worked before does not necessarily work for us now. We used to get free land or at a cost of almost nothing. For the 9,000 acres we had for Shah Alam, we only paid the land premium as we developed them. Then we parceled out some of our land to private developers in the form of joint ventures and privatisation project to get good returns from them,” he says. However, according to Othman, the last 15 years had been quite different, with PKNS buying 6,000 acres of Bernama Jaya land at market price, and to date have spent over RM480mil in land purchases and infrastructure development. It is also planning for further spending for infrastructure cost. “At the end of the day, how much margin can you make selling houses in Bernam Jaya?” he asks rhetorically. The state development corporation has also bought 1,500 acres in Selangor Science Park 2 (SSP2) in Cyberjaya at market price, and the infrastructure cost is said to be six times the land price due to bad soil condition. “When we sold land to German Q-Cells for the purpose of setting its solar factory, we had to sell below cost. This, of course, benefited the nation and the state in attracting more foreign direct investments and creating more jobs. However, we still need to find a more sustainable business model so that we can continue to subsidise our infrastructure development, our low cost and affordable housing schemes,” he says. The mega builder is also looking at various new business models and has revised the master plan for its SSP2 project and also Bernam Jaya. “We have spent RM1.15bil in land acquisition, earthwork and infrastructure cost since five to 15 years ago, and it is time to realise part of its value. Understanding that low cost housing schemes suffer from quicker deterioration due to poor living conditions and maintenance, PKNS has embarked on a new concept of affordable homes. “The new concept of affordable homes we are constructing in Bangi, for instance, requires five times more subsidy per unit than the typical low cost housing in order to provide the enhanced facilities offered. We are selling them at RM85,000-RM120,000 per unit while the cost and market value are at RM180,000 and RM220,000 per unit respectively,” he says. The new concept of affordable homes priced below RM120,000 will also be further fine-tuned for implementation. “The prototype development in Bangi is currently in progress, while the second affordable homes development in Gombak will be launched soon. Facilities include tuition centres, nursery, libraries, surau, commercial centres, lush landscaped gardens, planting and gardening areas and ground-floor units for families with old folks and the handicapped. A total target of 21,000 units has been set for implementation in the next 10 years,” he says. With a higher standard of living, he says, hopefully it can bring families out of the vicious cycle of poverty. Some families have been staying in low-cost apartments for three generations. With PKNS in operation for almost 50 years, most of its strategic townships have been fully developed and a major part of its strategic landbanks has been depleted. Othman says PKNS is now looking at increasing its land bank by a further 1,500 acres this year. “As we work on these high-yield projects, we also develop the remaining smaller land parcels in the Klang Valley, regenerate our old flats to produce the profit required to cross-subsidise the less strategic developments outside the Klang Valley and offer affordable homes. We have identified at least 10 new sites for urban regeneration and at least five new strategically located development land belonging to private and state government agencies for reverse privatization and joint ventures,” he says. With its vision to mould itself towards a more sustainable business model, Othman says PKNS needs to continue to build quality assets that can produce a more sustainable income. “In the next 10 years, we hope to create about RM10bil worth of assets that yield about 6% to 8% yield thus creating a sustainable passive income to help finance our social obligations,” he says. He says in the last two years, the business development arm of PKNS has been busy churning out new projects worth more than RM14bil, which he believes will be able to provide the pipeline of projects that can be converted into the quality assets to transform its business model to a more sustainable one. “We will be looking forward to more public-private collaboration with local and international partners to participate in our projects, especially the high profile ones. Recently, AmanahRaya Real Estate Investment Trust (ARREIT) and PKNS mutually terminated a proposed venture into the REIT industry with the injection of three properties Menara PKNS, Kompleks PKNS and SACC Mall with a combined value of RM270mil into ARREIT. “We are looking forward to injecting more of our existing properties into this REIT and lining up potential properties from our more strategically located redevelopment and urban regenerations projects in the Klang Valley,” he says prior to the termination. The injection mooted in 2010 would be in exchange for new shares and cash, which would make PKNS the second largest shareholder of ARREIT with a 33% stake. The deal was called off in light of potential planned asset enhancements to be carried out by PKNS on the properties, which would affect their market values. A local property analyst says the termination may not be the end of the deal, instead it may potentially be the start of PKNS injecting more properties into the REIT. On the outlook of the property sector in the Malaysia, he says the sector may see a slight decline in prices although it is currently on a stable plateau. Although PKNS is still linked to the state government, Othman says, as government servants, they have to be apolitical and just serve the government of the day. “I would also like to highlight that our board representation is well diversified with two representatives from the Finance Ministry, one from the Economic Planning Unit and state councillors. We don't take sides. We have to do our job and fulfil our agenda, and we only need to focus on those,” he says. In fact, he hopes to have more collaborative works between the state and the federal government. As holistic as it seems, with profit being just a means to an end, PKNS would still be treading on a fine line to strike a balance between being a social builder and a commercial developer. On one end it needs to fulfil its social obligations to contribute to a bigger agenda, but on another end it needs to make a profit to sustain its operations. As Othman says “balancing our profit and social responsibility is a major challenge”. In the next five to 10 years, the Selangor State Development Corp (PKNS) will be embarking on several projects, some of which may have some aspects of urban regeneration. This involves both residential and commercial properties. In 2010, PKNS had announced several key new developments, namely Datum Jelatek, with a gross development value (GDV) of RM900mil, PJ Sentral Garden City (GDV: RM2.6bil), Sports City (GDV RM1.8bil) and PJ Elevated City (GDV: RM2.2 bil). These projects are expected to elevate the state to another stage of progress. “We advise investors to watch out for the launching of the mixed retail, commercial and residential development in Datum Jelatek, comprising four residential towers that will be linked to the Jelatek LRT station, which is four stations away from the Kuala Lumpur city centre,” says PKNS general manager Othman Omar. He says PKNS's priorities in the coming years include the remaining development in integrated townships namely Bernam Jaya (6,000 acres), Selangor Science Park 2 in Cyberjaya (1,500 acres), Kota Puteri (2,000 acres) and Antara Gapi (900 acres). “We are introducing parcels for an internationally-acclaimed university hospital, factory outlets, hotels, an international elite golf course and golf academy, a private airpark and related industries, theme parks and a space tourism centre, among others. PKNS is also undertaking a reverse-privatisation' where we now develop land owned by other state agencies, government-linked companies or private land-owners in strategic collaborations,” he says. The business development division of PKNS has also announced RM14bil worth of new projects at various stages of development. These are mainly developments based on the concept of urban regeneration and redevelopment. “For lasting growth, these developments need to be supported by the required infrastructure, roads and interchanges for connectivity, public amenities, facilities, schools and the like. Many of these aspects of sustainability must come from the government,” he says, adding that there is a need to brand Malaysian cities in order to attract multinational companies. Despite having a quickly depleting land bank, it still have parcels of land dotting the whole of Selangor that stretches over 11 townships in nine districts. In the northern part of Selangor, lie three districts namely Hulu Selangor, Kuala Selangor and Sabak Bernam where PKNS has 6,217 acres, 125 acres and 102 acres respectively. It also have land banks in major townships in Gombak with 994 acres, Petaling (67 acres) and Klang (1,161 acres). In the eastern side of the state, it has 158 acres in Bandar Baru Bangi and Kajang, while in the south, PKNS has 1,500 acres in Dengkil, Sepang. Collectively, the total value of these land banks is estimated at over RM4bil. Although PKNS has several pockets of commercial land in the Klang Valley that is less than 10 acres, these parcels have a potentially higher GDV as they are in more strategic locations like Petaling Jaya, Kelana Jaya, Shah Alam, Bangi, Kota Damansara, Ampang Ulu Kelang and Sg Buloh. “Most of our strategic townships are fully developed and a major part of our strategic land banks has been depleted. As a result, the biggest chunks of our land banks are presently outside the Klang Valley. To overcome these challenges, we have been transforming dilapidated brownfield areas like our old flats and industrial areas built 30 years ago into vibrant and sustainable integrated mixed developments,” he says. PKNS has identified at least 10 new sites for urban regeneration and at least five new strategically located parcels belongong to private and state government agencies for reverse privatisation and joint ventures. Besides getting busy with its own projects, PKNS has also undertaken the development of several abandoned projects. This includes Bukit Botak which involves 1,422 units of semi-detached houses originally undertaken by Delpuri Corp Sdn Bhd. “Not only did we finance the RM140mil project but we also subsidised RM79mil in order to price the units at RM99,000 each whereas the cost and market value is at RM180,000 and RM200,000 per unit respectively,” he says, adding that for the record, PKNS has never abandoned its own projects. Despite the impression that government-linked agencies are inefficient and lacks transparency, PKNS is leading the way to be more transparent in its dealings with private developers. “We have enjoyed very good returns from these investments in terms of dividends and scheduled payments. With our good reputation as a partner, strategic land bank and transparent approach towards our selection method, we have been able to attract the best offers in our request for proposals (RFPs). Our latest RFP for Kelana Jaya Sports City where over 40 companies participated, the best offer was a guaranteed return of RM422mil to PKNS inclusive of the performing arts centre and stadium,” he says. Melati Ehsan Bhd emerges as the winner after three rounds of assessment of 40 companies comprising local established companies and also one Chinese company. “Our panel of independent committee comprising accountants, financial advisors and architects took over a year to evaluate the proposal. Melati Ehsan got it because of merit,” he says. Recently, the application for redevelopment of the PKNS field and sports complex in Kelana Jaya was turned down at a public hearing due to technical non-compliance. “We are going to take our time to re-assess the project and make the right amendments to the project and will accommodate the comments that was made during the public hearing,” he says. He says the project is not going to be just any profit-driven project, but will be a new Green Building Index landmark and branding project for Kelana Jaya. “Whatever the proposal, we will have 70% of the original land being kept in various levels as open space, and these are the good points that people should see. The project will have fields and complexes that house the podium and facilities like the sports complex, performing arts centre, traditional game field and an open-area landscape,” he says. He says the complex has never been opened to public before but only for PKNS functions, but with the said project, the facilities will be available to the public. “Its up to our board to decide, bearing in mind that PKNS has an obligation to the five million Selangorians,” he says. How has the PKNS fared in the last two years? We are grateful to be able to achieve continuous profitability during the last three global economic crises. In fact, during the most recent global economic crisis of 2008/2009, PKNS’s operational profit increased significantly compared to the previous financial year supported by aggressive marketing and rebranding. We made a profit of RM165mil in 2009, which increased significantly to RM206mil in 2010. We expect our profit to increase to RM480mil for 2011. PKNS’ audited accounts for the year ended Dec 31, 2010 saw a profit before tax of RM196.8mil, an increase of 18.5% or RM30.7mil from RM166.1mil in the previous financial year. The 2010 figures are purely operational profits, not considering the profits to be generated from our real estate investment trust exercise (estimated cash at RM162mil and profit of about RM82mil) and diversification from Kesas (estimated at RM150mil) which will be posted under 2011. The extensive marketing of our products has helped us to achieve better sales in 2010. For example, we managed to sell RM85mil worth of properties in three days at our Selpex 2010 Property Fair at Shah Alam Convention Centre. Although 2009 was a tough year for most property developers, considering the global economic crisis and the rise in material prices, we achieved a respectable profit even after making a provision for a RM78 mil loss in the Bukit Botak resettlement project. For 2011, we expect to at least double the profit we made in 2010. We need to segregate between our economic and commercial projects and social projects so as to get the best use for our land and thus optimise the return on these projects. If we focus only on doing the heavily subsidised affordable and the low cost housing, we will have nothing left to contribute (for the coming years). This balancing act is very important to ensure our continuous profitability, and thus sustainability in delivering our social obligations. What changes do you want to see in the development of Selangor, and what role PKNS can play in this? As the most developed state in Malaysia, Selangor needs to set the standards and benchmark in property development and other areas of growth. At the same time, Selangor is saddled with the same problem as most of the states in the country – a disproportionate representation between high-end properties and those which are within reach of the majority of our people. It is the duty of PKNS to create more affordable housing developments to fill in this void and maintain a balance in the social ecosystem. In line with this, we launched the Section 14 Bangi project early this year and we target 11,000 new concept units in the next five years. As of this year, the PKNS has developed 11 integrated townships. We realise the importance of integrated township and developments that feed into each other. These industrial components create jobs as well as meet the people’s housing needs while the institutional component fills the need for education. The commercial and retail aspects allow business to flourish within these townships. Such projects also require additional investment into infrastructure development. This includes the need to build better roads, interchanges and the extension and improvement of public transport system. For example, our projects in Datum Jelatek, PJ Sentral Garden City, Section 14 PJ will be linked with LRT stations while we plan to provide shuttle services to LRT stations in Sports City and PJ Elevated developments. The mega projects that we are embarking on are currently focused on the concept of urban regeneration while the rest of our developments also have the community in mind. Q-Cells, the world’s largest solar panel manufacturer with its headquarters in Germany, has been in operation in Selangor Science Park 2 (SSP2) since May 2009. PKNS is also in negotiation with some local and international parties to develop solar and wind in order to promote green renewable energy in SSP2. UEPE Bhd is also planning to develop three parcels of the lakeside commercial centre and a few residential parcels and a factory outlet complex in SSP2. We have also signed a sales and purchase agreement with the developer of the International Medina University to set up its campus for 20,000 students and we are in negotiation with another internationally renowned university for a similar enterprise. Would you prefer to build affordable housing or low-medium cost housing or generally townships development? We need to strike a balance between supply and demand for affordable and low-cost housing and township development especially in terms of location and pricing. There are many low-cost housing in less strategic locations that have been empty for years. We have built over 50,000 low-cost units in the last 47 years. Although they have served well in terms of providing more affordable housing for the low income group in the last few decades, they have also created problems along the way. Building and maintaining low-cost housing schemes is a very expensive affair as many developers already know. In terms of buying trend, young couples nowadays don’t want to stay in low-cost housing schemes. These are the people who will be our main house-buyers in the future. The state has since 2009 come up with a new concept of affordable homes that could provide an alternative solution to these low-cost schemes. The new concept focuses not only on the hardware (the architectural and building design), but also the “software” that goes in it (the people, facilities to accommodate a lifestyle). We prefer this new concept as it offers better value, more enhanced facilities and a better quality of life. In the case of township development, heavy capital outlay is required in constructing the required infrastructure. On average, we spend between RM1bil and RM1.5bil on infrastructure development for each township, which includes the road network and interchanges, earthworks, water reticulation, sewerage system, telecommunication infrastructure and other facilities. Unless you buy the land cheap, the financing cost over the longer development period can be very substantial. Alternatively, we can parcel out and jointly develop with other private developers to expedite the overall development or share the infrastructure cost like what we did for Kota Damansara, Bangi and Shah Alam. In SSP2 and Bernam Jaya, we synergise with investors, college operators and private developers that can add value to our development. How does PKNS give back to the community? How much is it involved in corporate social responsibility (CSR)? Serving the people’s needs is fundamental for us. In line with this, the profits that we make are funnelled back to the rakyat. This comes in the form of building low-cost apartments, affordable homes and subsidising the development of public housing, among others. We also put in place initiatives to support Selangor’s small and medium enterprises (SMEs). SMEs are a large contributor to Selangor’s economy and we assist them by alleviating high overhead costs and catering to their business needs. The PKNS Business Centre and Virtual Office (VIO) at PKNS Bizpoint and PKNS Real Plug n Play based in Cyberjaya provide this assistance. VIO offers serviced suites and virtual offices to business owners without the expensive set-up costs and overheads. Plug n Play is an ecosystem conducive to the technopreneur community. To add value, we have signed an exclusive agreement with Plug n Play Techcenter of Silicon Valley in California to support and expedite the growth of digital solutions start-up companies in Selangor. We believe in giving back to the community, and this is something that we have done before CSR was a trend. Recently, we contributed RM5.2mil to Yayasan Selangor’s development of a hostel complex and RM450,000 more for the construction of a school in Kota Damansara in Petaling Jaya. Will current breed of developers cater for needs of city dwellers? The clouds of tough times are looming again and the local property market looks set to be in the path of the gathering headwinds this time. Needless to say, the need for more affordable housing projects that offer smaller but functional homes will increase as Malaysians become more cost conscious and watch over their expenditure to avoid from over committing themselves. Latest statistics on the people's affordability level shows that less than 5% of Malaysian households have combined income of more than RM10,000 per month. The trend is also for fewer children and smaller households, which makes it a natural choice to opt for smaller and more basic homes. This makes the luxurious larger home market a smaller segment of the overall market although demand for such property is still there. Besides the ease of lower maintenance needs, such housing units are also easier to upkeep. This brings to bear the huge popularity and long queue whenever projects involving small office, home office (SOHO), and more recently the small office, versatile office (SOVO) variety are launched in the Kuala Lumpur city centre and the peripheral addresses. There is room for more projects that offer smaller built-up area but have versatile layout plans that allow for different uses including to be used as a home office. This makes the property multi-functional which explains its huge success among young Malaysians. Some of the super luxurious projects in the city centre with huge built-up area of more than 10,000 sq ft can also be redesigned and retrofitted to cater to this group of eager buyers. Bringing down the size and price of these units will make them more affordable. Otherwise, the large number of unsold apartments in the city will stifle efforts to bring life to the city after office hours. The large inventory could explain why prices of luxurious condominiums in the city remain stagnated after shedding around 20% since the onset of the global financial crisis in 2008. Coming out with more “out of the box” and versatile designs will help to pacify the needs of the market better. Another subject of interest is the ongoing merger and acquisition (M&A) activities in a number of industries in the country that has raised concerns about whether it may clip competition and stifle the competitive spirit among industry players to outdo each other. Most of the time, free competition has been the panacea of greater market and corporate efficiency that can result in bigger benefits to consumers. In the spirit of the survival of the fittest, competition to excel will lead to greater effort to do better and a search for better solutions to drive costs down. Whatever the industry or service sector may be, the presence of more than one player tends to spur a more competitive spirit that often show up with better terms, service standards, and lower prices or charges to consumers. Ultimately, competition will benefit businesses, consumers and the overall economy as a whole. So how will the intensifying M&As impact businesses and consumers especially if they result in more collaborative and friendly industry players? I have a feeling that unless these M&As are managed professionally and do not sacrifice the competitive spirit among the involved parties, consumers may find themselves at the raw end of the deal. And the companies and the economy may also suffer as a result. With consumers growing more cost conscious and hunting for better deals, naturally greater competition that sweeten the deal will be more palatable for them. Hopefully, the ongoing M&As between a number of local property players will be able to bring forth some positive outcomes for property buyers through more exciting and ingenious projects. In the spirit of the Competition Act 2010 that came into force on January 1 this year, developers who have taken the M&A route should preferably retain their respective competitive advantages and continue to up their ante in terms of product offerings, quality workmanship and design plans. Keeping the competitive spirit alive will promote more competition to bring to market more viable and interesting projects at more competitive pricing. Deputy news editor Angie Ng wishes all Malaysians a blessed and blissful 2012 with hopefully great promotional offers coming our way. Vientiane, Laos may not be strongly associated with the world of big business but it has an interesting story unfolding that contains a strong Malaysian twist. It is a saga that the burgeoning business community of Vientiane as well as the top Laotian and Malaysian government officials are familiar with. 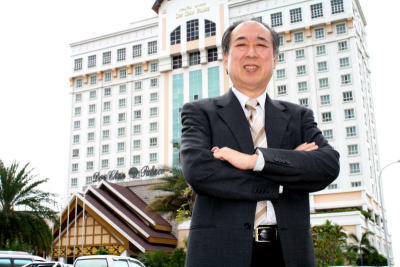 At the heart of the story lies a low-profile Malaysian businessman Cheok Tiam Cheng, who had since 2003, taken on a pioneering project in Vientiane to build the city's first five-star hotel to help it host the Asean summit in 2004. The Don Chan Palace hotel, with its 240 rooms, is an imposing sight in Vientiane along the Mekong river bank and until today, it holds the record of being the tallest building in the city. Cheok and his hotel were the toast of the town in the early years after it was built. Battling against the odds, Cheok and his team had built the hotel in a record time of nine months for the summit, Besides not having enough skilled workers, he had to deal with the settlers on the land as well as the unrelenting torrential rain during the construction period. The hotel was sanctioned by the governments of Malaysia and Laos as the latter was trying to pick itself up after a lengthy civil war that paralysed the country's progress. The Don Chan Palace would serve Laos' needs as a venue to host important conferences and to house VIPs. It has hosted dignitaries from the prime ministers of Malaysia and other countries in the region. Even Condoleezza Rice, the former United States Secretary of State, had checked in before. Today, Cheok, 60, is facing the possibility of the hotel being taken away from him. Cheok is fighting to keep his creditor, namely a large Malaysian bank, from selling the hotel to recoup its loan. In Vientiane, there are rumours that the hotel has already been sold to China CAMC Engineering Co Ltd (CAMCE) and that a joint venture is being set up between CAMCE and another Malaysian party to jointly own the hotel and its adjoining land. The interest of foreign parties in the hotel is not surprising, as it has a hidden asset. As part of the deal with the Laotian government dating back to a 2003 master agreement, Cheok has the right to develop up to 6km of the adjoining land along the Mekong river. In the original loan agreement, the plan was for Cheok to also build a shopping complex on the adjoining land to be leased out or sold and the proceeds used to repay the loan. According to Cheok there is an understanding that the bank would help finance the development of the surrounding properties. However, that plan did not work out as expected. “There was an increase in the cost of construction of the hotel as it needed to meet a certain deadline and there were other problems including the weather, lack of skilled workers and difficult terrains. As a result, the monies from the loan that were meant for the shopping complex was drawn down to complete the construction of the hotel. Cheok had attempted to go ahead with the shopping complex but he had only enough money for the foundation work. The bank has declined to provide him more financing for the rest of the project, leaving him in a catch-22 situation. Cheok tried another plan: building villas and bungalows on the adjoining land as a means to repay the loan. However, that move was also in vain. “The developers who joined us in the project could not get the bank's consent to redeem and secure the sale of the land,” says the embittered Cheok. The bank had granted Cheok a loan of RM28mil for the project in 2003, which Cheok has been unable to service. This is the basis of the bank seeking to sell the hotel and its adjoining land. The bank is claiming RM35mil from Cheok, including outstanding interest. Cheok says he has made a repayment of up to US$5mil (RM15.5mil) but that no statement of account has been provided by the bank. Cheok says he is not disputing the debt but he against the manner in which the debt is being claimed by the bank. “The bank hasn't notified me of any sale and yet the whole town is telling me that the hotel has been sold. And if it has been sold, there is the question of price. I have a valuation that shows that the hotel and adjoining land is worth much more than the outstanding loan amount. Hence the bank should give me back the surplus but there's no mention of that,” he says. Cheok produced a valuation report done by the International Commercial Bank Lao Ltd, dated 29 March 2010, that valued the hotel at US$23mil and the adjoining land that Cheok is entitled to at US$48mil. “This valuation also took into account the amount of money spent by us to put up the hotel in record time and to move millions of tonnes of earthwork as the land was initially not suitable for construction as it was swampy and filled with gullies and ravines,” Cheok says. The bank has also initiated legal action in Malaysia to claim its monies from Cheok. Cheok has filed a defence against that action as well as a counter suit against the bank at a whopping sum of more than US$2bil (RM6.2bil). This is on the grounds of general damages, disruption and loss of business of the hotel and opportunity of developing the shopping complex, as well as on the value of the adjoining land. Cheok's lawyers also say they have an option to refer the matter to arbitration. Cheok's venture into Laos could be traced to 2000 when he went to Cambodia to look for business opportunities. While in Cambodia, the ambassadors of Malaysia and Laos had suggested to Cheok that he invested in Laos and a meeting was quickly arranged between him and the then Loatian Prime Minister Bounyang Vorachit, who was visiting Cambodia. After having completed the Don Chan Palace, Cheok said the Loatian government gave his company an electronic gaming licence as well as a banking licence. But the operational permits for these businesses have yet to be issued to him in light of the current developments. When Cheok first met up with Laotian government official in 2002, he had also inked agreements for a hydro-electric construction project, a hotel and casino in Pak Song, cattle farming, coffee and plantation development projects. Cheok had started work on the Pak Song hotel and a casino but he faced the challenge of having to rid the land of undetonated World War 2 bombs and land mines a persistent problem in Laos which is the most heavily-bombed country in history. Through it all, government officials from Laos and Malaysia are keen to see the matter resolved. Laos will be hosting the Asean Euro Summit 2012 and the Don Chan Palace is expected to be the main venue of this event. But Cheok says he's in a tight spot as the Laotian government has requested him to refurbish the hotel in time for the conference. “In good faith, we have offered to renovate the hotel at our own cost. But we have asked that in the event we lose the legal battle against the bank, it should pay us the amount that we spent on the renovations. But the bank has refused to entertain any of these proposals and have only offered to buy back the hotel at the current market price and we should proceed with the renovations. That is ridiculous,” he said. Ridiculous or not, Cheok, the Don Chan Palace and the bank continue to be the talk of town in Vientiane today and it will be interesting to see how the matter will be resolved if at all.